The Warrior Forklift Access and Maintenance Platform has been designed, developed and built to give outstanding long service with minimum maintenance required and assist with all manner of access and maintenance requirements within industry and commerce. A sound long term investment! The platform has a maximum load capacity of up to 300 kg and is recommended for use with one person and tools. 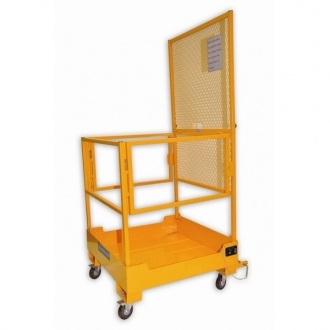 Designed for use with rider operated counterbalanced and reach fork lift trucks, the Tiger Forklift Access and Maintenance Platform is operated by firstly securing the unit on the forks of the forklift and then lifting to the desired height. This unit collapses down for storage and is supplied with swivel castors for ease of manoeuvrability on the ground.